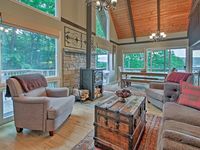 A mountain cabin with western decor at Echo Lake/Cathedral ledge. Property 54: A mountain cabin with western decor at Echo Lake/Cathedral ledge. Cozy Bartlett Cabin - 5 Mins to Attitash Resort! Property 55: Cozy Bartlett Cabin - 5 Mins to Attitash Resort! Property 57: Lakefront Denmark Cottage w/Dock,Canoe & 4 Kayaks! Property 63: Traditional Maine cabin located on McWain Pond, Waterford Maine! Property 64: Cozy 2BR at the base of Cathedral Ledge - AC, Deck w/ Grill, Cable & WiFi! The Charming Conway Cottage is centrally located to all the Valley activities! Property 65: The Charming Conway Cottage is centrally located to all the Valley activities! 1 Mile To Storyland And Short Drive To Many Family Activities! Great Amenities! Property 67: 1 Mile To Storyland And Short Drive To Many Family Activities! Great Amenities! Property 71: Long Lake - Spectacular Views of Mt. Washington from dock, decks, cabin. Now available for winter season rental!! Property 72: Now available for winter season rental!! Property 74: 5 STAR Magical Waterfront Cabin on Papoose Pond! 25 Minutes to Sunday River. Property 75: Lovely Cabin w/Deck - By Storyland & Attitash Mtn! Cozy cabin w/firepit just minutes from skiing & Fryeburg Village! Dogs OK! Property 76: Cozy cabin w/firepit just minutes from skiing & Fryeburg Village! Dogs OK! NEWLY RENOVATED! Spacious 4+ Bdrm Lake House w Amazing Lake & Mountain Views!! Property 79: NEWLY RENOVATED! Spacious 4+ Bdrm Lake House w Amazing Lake & Mountain Views!! NEW! 3BR Bartlett Cabin in Mt. Washington Valley! Property 82: NEW! 3BR Bartlett Cabin in Mt. Washington Valley! Relaxing Lakefront Cabin With Private Dock On Moose Pond. Wifi And Cable Tv. Property 84: Relaxing Lakefront Cabin With Private Dock On Moose Pond. Wifi And Cable Tv. Ossipee Lake WATERFRONT Cottage - Private beach/dock, lovely mountain views!! Property 87: Ossipee Lake WATERFRONT Cottage - Private beach/dock, lovely mountain views!! Property 89: Adorable cottage set among tall pines with sandy beach a half mile from town. 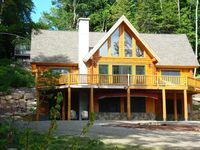 Kezar Lake Waterfront Lakehouse - Swimming, Boating, Fishing Awaits! Property 90: Kezar Lake Waterfront Lakehouse - Swimming, Boating, Fishing Awaits! Property 91: Beautiful Spacious Custom Built Log Cabin. Property 95: Conway Area Chalet w/ Mountain Views & Fire Pit! Long Lake Maine - Create Your Family Vacation Memories Here! Property 96: Long Lake Maine - Create Your Family Vacation Memories Here! Updated Chalet w/ Deck - Near Skiing & Story Land! Property 100: Updated Chalet w/ Deck - Near Skiing & Story Land! Perfect house to accommodate all of us.